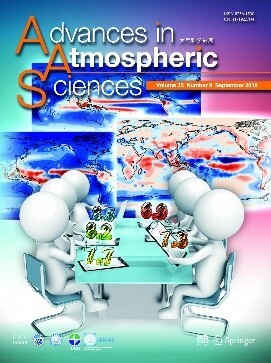 Susannah Burrows, Earth and Biological Sciences Directorate (EBSD), and Aritra Dasgupta, National Security Directorate (NSD), are the lead writers of "Characterizing the Relative Importance Assigned to Physical Variables by Climate Scientists when Assessing Atmospheric Climate Model Fidelity," to be the cover feature in the September issue of Advances in Atmospheric Sciences. The article was co-authored by Sarah Reehl and Lisa Bramer of NSD and Po-Lun Ma, Philip J. Rasch, and Yun Qian of EBSD, and is now available online. The study, led by Aritra and Lisa, reports results from a survey of climate scientists on the relative importance of different physical variables for assessing climate model fidelity. This is a step towards improved understanding of how to assess these complex models, whose multiple optimization criteria may come into conflict. Susannah was interviewed by a science reporter from the American Association for the Advancement of Science (AAAS) for an article published in EurekAlert about the cover article. Susannah and Aritra are jazzed about the cross-disciplinary approaches they have developed, applying methods from social sciences and visual analytics to climate science. They see a great potential for these approaches to enable greater insight into how climate models respond to different inputs, as well as how scientists arrive at overall evaluations of complex models with many optimization criteria. "I am very happy about this outcome from an LDRD project and I hope the collaborations will continue into my academic career as well," said Aritra, who will be leaving PNNL for a career in academia in August.